RJ45 connector is designed for single-core shielded FTP cable of CAT5e category. The connector has guide grooves and has no plastic insert. Quality gold coating (3 micron) provides reliable contact with the cable cores. 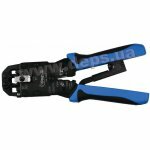 To create the reliable conductors connection it is recommended to use a special crimping tool – “Cor-X UA-3088”. The integrity and the circuit closing of cables while using the RJ45 connectors (CAT5E shielded) can be checked with a handheld cable tester – “Cor-X UA-3093”. Cor-Х UA-3088 Crimping Tool is designed for cutting-stripping-crimping of connectors 8P8C/RJ-45, 6P6C/RJ-12, 6P4C/RJ-11, 4P4C & 4P2C plug & DEC / off set plug-6P6C.